I've already been out on the water more this April than in the whole of last summer - mainly due to the easiness of using the Bic Ouassou kayak. And the astonishing weather. This morning in Hillswick it's like summer - genuinely hot in the sunshine. It's flat calm, too. Bruce (local blacksmith and all round expert in all things nautical) came round for a look at the Kestrel dinghy, and we managed to raise the mainsail, revealing a need for some sewing action. Still, the wee fibreglass boat is sound and this morning's post brought a restored British Seagull outboard for it. Of which much, I expect, later. 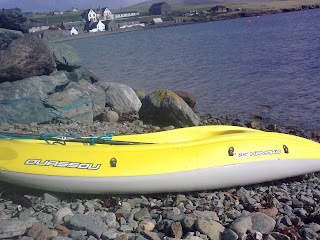 Bruce also offered me the makings of a mooring, so with that it was out in the kayak for a wee bit of depth sounding. It was also a chance to try out my new camera. Taking pictures is one of the great pleasures of being out on the sea, but I was always conscious of how easy it would be to damage a digital camera with seawater. So, off to eBay, there to obtain a Vivicam 5399 camera with 15-metre underwater case. How much? For five megapixels? Nine pounds. Not ninety. Nine. Less than 10. Ebay is a wonderful thing. And this is the result. A picture of Hillswick I've been trying to take for years, showing the red cliffs of the Eshaness peninsula behind the village. Hillswick is basically built on a shingle spit. When I finally beached the kayak after an hour or so, I was overcome with an unwillingness to return to dry land. Still, work calls! 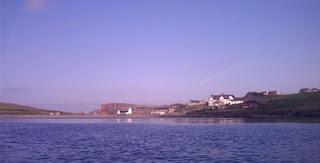 This is Hillswick, from the sea. 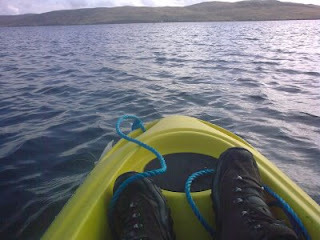 I decided to try out the old Sevylor inflatable kayak, and fortunately chose a calm night. Only the camera escaped getting wet. The big white building (with patches of new wood where it's being repaired) is the St Magnus Bay Hotel, now going like a train under the ownership of Andrea and Paul. Sadly, the Hillswick shop (lower right) is currently closed, though a community buyout is currently being attempted and will hopefully succeed. On the lower left is The Booth, or Da Bod, originally a Hanseatic trading booth, then a pub. It's now the Hillswick Wildlife Sanctuary. There's a great picture to be taken from a bit further out, which appears to show Hillswick shadowed by the great red cliffs further out towards Eshaness. 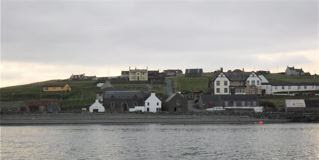 The village is essentially built on the stony beach between the Hillswick ness and the rest of the mainland. I've written previously here about the 'other' Tom Mortons, but a strange thing happened today at the excellent Brae Sunday Teas (and car boot sale - fundraising for Martha's school trip to...somewhere). I was speaking to someone who had been reading a book about the Salvesen shipping line. Salvesens of Leith was hugely important to the economy of Shetland right up until the 1960s, as they employed many islanders in the South Atlantic (Antarctic) whaling. Anyway, I was told today that Salvesens had a ship called, wait for it, the Tom Morton. At first I thought this was a joke, but no, a bit of checking revealed that in the early years of the Salvesen company, they bought a ship built in Leith by the engineers and shipbuilders S&H Morton and Co, owned by one H Morton and yes, called the Tom Morton. Tom Morton 1872 S. & H. Morton & Co., Leith Ex Tom Morton built for H. Morton, Leith, 1884 purchased not renamed, 1886. Went missing at sea. 1,402 tonnes. some of the proceeds will go to the Parkinson's Disease Society in honour of Michael Jackson." This was originaly written as a forum post at All Media Scotland, in response to an article by Professor Brian McNair. First CD I ever heard was at a demonstration evening in the old Albany Hotel. Inevitably, it was Love Over Gold by Dire Straits. Brian's interesting piece brought all this back. But his assertion of vinyl's disadvantages in favour of CD, coupled with a defence of newsprint's thoroughly 'analogue' advantages over online, surely misses the real lesson of how digital technology has affected the consumption of music. Because it's not CD that we ought to be looking at, but online music distribution systems. Not even the likes of second-stage digital gubbins like ITunes, but more to the point the painfully zeitgeisty Spotify, which puts constantly available, unlimited streamed music onto every computer for the price of a few adverts. The killer app of said app will be its availability on mobile phones. We're weeks away from that. Soon you'll be carrying access to all the music in the world with you, all the time. We're not far away from already having access to everything newspapers can offer through our phones. Brian's listing of newsprint's benefits (tearing bits out, flipping back and forward, lovely touchy-feely analogue notions that already reek of nostalgia) can be replicated online (see The Scotch Malt Whisky Association's online magazine, Unfiltered, for example). Making it work effectively, making it comfortable in the pocket, is the key. The Kindle Reader and its competitors are halfway there. Merge that with an iPhone and some smart software, and newspapers will only be for hacks and luddites. And yet... it's there, surely, that we'll see both the end of newsprint and the beginning of a longing for its finger-licking inky advantages. Because just as Spotify has fuelled in me a desire to own vinyl and enjoy the (yes) superior sound quality, better artwork and sheer tactile pleasure, maybe mobile phone news consumption will spark off a longing for fumbled broadsheets and smeared tabloids. Like those newspapers-from-your-birthday gift offers, they'll come in presentation boxes, possibly, and be pored over with little sighs of pleasure. They'll be about memory, not news. This is a link to one of the most famous pieces of maritime film ever: Irving Johnson's incredible amateur footage of his 1929 voyage 'the wrong way' around Cape Horn, from Hamburg to Chile, aboard the biggest sailing ship afloat at the time, the nitrate carrier barque Peking. No motors of any kind, everything done by hand. And some of the scariest storm footage ever shot. Fantastic commentary, too, from Johnson himself. It's 36 minutes long. Shot using a big hand-cranked film camera, too. Unbelievable. Amazingly, the Peking is still afloat, albeit as a visitor attraction at the South Street Seaport in New York. Johnson was an astonishing character, who lived until he was 85. And relatively dry, too. I've always fancied kayaking and done a bit of pool training, but hated the sense of being trapped from the waist down in a plastic tube. This is a BIC (same as the pens) Ouassou sit-on-top. So no sense of enclosure. Despite two large holes right through the hull ('self-draining scuppers')it stays amazingly dry and it's very stable. It is, in fact, a joy for messing about not too far from shore. Half an hour later, regretfully, having been thoroughly investigated at close quarters by two seals, I hauled the wee yellow boat ashore. It works! It's great! A shorter version was written for Shetland Library's 'Bards in the Bogs' scheme, but the site specific nature of the poem probably told against it: it can only be displayed at the Voe toilets, an important, nay crucial staging post on the long road, the A970, between Lerwick and the North Mainland, especially if drink has been taken on board in Coalfishreek. This is part of the live show Tom Morton's Drinking for Scotland, booked for the Belladrum Festival's Co-op Verb garden. And possibly elsewhere in due course. The Wire being on terrestrial telly is truly odd, I think. People are saying 'it's rubbish', having watched three episodes, clearly without ever hearing Wiremeister David Simon's brutal dismissals of 'the average viewer', in whom he claims not even to be slightly interested. ...meanwhile, on to the next David Simon and Ed Burns show, Generation Kill, based on the book (which is pretty good, but not as good as the series) by Evan Wright, an 'embedded' Rolling Stone journalist with the First Recon Marines in the Second Iraq War. Like in The Wire, you have to get to know the various characters, and this time you're basically stuck in a Humvee with them. It's like Black Watch crossed with Three Kings, only much, much better. And you don't have to go a bloody theatre. Also like The Wire, once you're involved with these people, good and bad, abandoning them becomes unthinkable. The DVD boxed set is pretty dear just now, but I would say essential viewing. Love the details: all the marines' info comes from BBC World Service radio. The commander ends up addicted to cricket coverage. "Gentlemen. From now on, we're going to have earn our stories..."
The helicopter went into the sea around 2.00pm, and within half an hour there were Twitter and, using automatic feeds, Facebook posts about what had happened. I was on air at the time and I found out through social media, which obviously plays a part in how the programme works. It's important for news to get to a live music show so we can avoid tasteless or offensive clashes between records or band names and current events. Helicopter Girl would have been out of the question yesterday. Given events at the G20, we came close to dropping the Clash's Rock The Casbah. For me, living in Shetland, within the sound of offshore helicopter operations and with a heightened sense of the North Sea's dangers, yesterday's fatal crash was of enormous importance. But that was true for everyone in Scotland, where we all know someone who works 'offshore', and for whom the North Sea oil industry has, I think, something of the mythic importance that deep coal mining once had for my parents' generation. It is part of our identity. I thought BBC Scotland (and I'm trying not be biased here; I do work for them, but this blog is staunchly independent! )reacted admirably and with both commitment and restraint. The story was both reported as a piece of live, developing news and placed carefully in context. But the 'national' UK news, not just at six o'clock but throughout the evening, even when it was clear that 16 people were dead, didn't just lead on the G20 talks in London and the associated (mild) unrest, it insisted on relegating the helicopter crash way, way past the Obama-gives-Queen-Ipod fluff and the Royal Bank of Scotland vandalism. To say I was disgusted was putting it mildly. A reporting agenda had been set in London early in the morning, the coverage had been budgeted for and planned, and nothing, NOTHING was going to deflect that intensely metropolitan set of news values. Even this morning, Radio Four is leading its news not an actual events in London, but on speculation as to what may or may not happen later in the day. By contrast, Radio Scotland's Good Morning Scotland is a live outside broadcast from Aberdeen Harbour, with reporters live in Peterhead and elsewhere. Only there could I find out the crucial fact, for Scotland (and Shetland) that Bond had suspended all North Sea operations. Something which could have major implications for the oil industry as a whole. I can honestly say that I have never felt so betrayed, so overtly, by a set of journalistic decisions. Nor have I ever felt quite so Scottish.